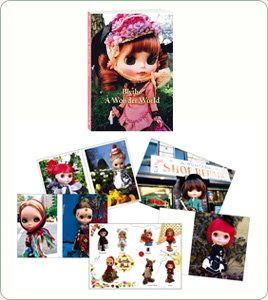 In the summer of 2008, the 4th Blythe photo book "Blythe A Wonder World" is released. Following the pattern of "Blythe Moment" released in 2006 and "Blythe Rhapsody" in 2007, the newest anniversary photo book will be a lovely edition to your Blythe library. The first section of "Blythe A Wonder World" features photographs of 70 fairytale-themed Blythe dolls that will be displayed at the Anniversary Event "Once Upon A Wonder World"! A selection of beloved childhood stories will come alive with Blythe and with Hiromi Sato's poetic illustrations. The second half of the book contains the images of 58 Blythe dolls presented at Paris Pret-A-Porter Spring and Summer collection 2007, 40 dolls from last year's charity event in Japan, and the finalist dolls of the 2nd Beauty Contest, all photographed by by Gina Garan and the Junie Moon design team. All of the dolls on this photo book will be auctioned off at the charity auction. Be sure to add this stunning tome to your collection! The photo book will be sold at the anniversary event, it will be available at bookstores across Japan from July!